0.25 CTW ROUND DIAMOND MEN'S BAND -A lifetime of happiness starts with sweet wedding vows. 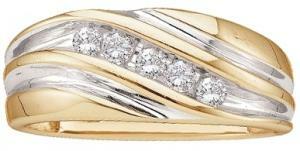 Seal your commitment to him with a 10 karat two-tone gold wedding band that is just his style. Emitting pristine brilliance at the center, five round diamonds in an invisible-like setting totaling 1/4 ct. reflect light within the white gold band. Completing the look, warm yellow gold barriers display intriguing contrast along the edging.